A week of action from 21st - 30th of June 2013 in Aughoose, Pullathomas, County Mayo. Make this the week you come to visit Rossport. Come to the Rossport Solidarity Camp, Pullathomas, Co. Mayo for a week of action in June against Shell’s Corrib Gas Project. This week has been called to coincide with one of Shell’s busiest work times. Come to act in solidarity with the 13 year old campaign in Mayo against Shell’s Corrib Gas Project. The week will be jam packed with a wide variety of actions! There will be something useful for everyone to do, regardless of your experience and skills. The Rossport Solidarity Camp is being erected specifically for this week, and will be taken back down when the week is completed. So if you are planning on traveling to Mayo this summer - make it this week! This is a call out to the thousands of people who have visited the area in the past, and to new faces who are interested in joining us for the first time. If you are new to taking action don’t worry - all kinds of skills and roles are needed during the week of action and you will be able to play a role that you are comfortable with. If you know the area and have ideas for action - get prepared and come with an affinity group if possible. Ireland is being stripped of its wealth and resources. While most people are feeling the effects of reduced public services and cuts to income, Ireland’s debt crisis is being used as a further excuse to privatise resources for the gain of already rich shareholders. Our oil and gas, forestry and possibly even our water are all in line to be used for private profit instead of public good. One inspiring community who have been fighting this takeover are the residents of Kilcommon, Co. Mayo. Local residents have been resisting Shell and the government’s attempts to build an inland refinery and dangerous raw gas pipeline in their community. Now, as we face attacks on public services, income cuts and plans for ‘extreme energy’ resource extraction accelerated by the demands of the IMF-ECB, the struggle of a small area in Mayo is becoming a much broader fight for a fair and democratic Ireland. Ireland’s government is running an experiment to see how much people will take. No one is happy about the way our country is going - but we need a place come together and focus our resistance. In the 1970s, a people’s movement came together at Carnsore Point in Wexford and stopped the government and the nuclear industry’s plans for Ireland. If anywhere can be such a rallying place for our social movements now - it is Rossport. In June 2013 we are setting up Rossport Solidarity Camp and hosting a week of action. Our plan is to disrupt Shell’s operations in the area. Come and join us between the 21st and 30th of June. The campaign against Shell’s inland refinery and high-pressure pipeline, the ‘Corrib gas project’ near Rossport in Co Mayo has been long and extraordinary. It began in the year 2000 when a plan was announced to build an inland gas refinery and a 9km ultra-high pressure raw gas pipeline through several villages. In 2005 the imprisonment of five local men who became known as ‘the Rossport Five’ brought the campaign to national and international attention. Residents launched a national campaign called Shell to Sea in early 2005, demanding that the gas be processed offshore away from communities. Local residents and their allies continue to oppose the threat to local health and safety as well as highlighting human rights concerns, environmental damage and economic injustice. Over the 13 years of resistance so far, tactics have ranged from High Court actions, planning objections and lobbying politicians to grassroots campaigning, civil disobedience and direct action. Through a combination of these tactics the community and their supporters have delayed Shell’s project for 10 years to date and more than tripled the cost of the project to over 3 billion euro. Over the past eight years thousands of people have come to the area to lend their support - for days, weeks and years. 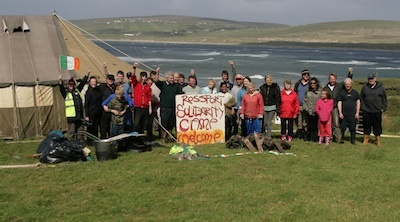 Rossport Solidarity Camp was set up in 2005 and since then has hosted people from around Ireland and the world seeking to learn about and support the struggle. This week of action is hosted by Rossport Solidarity Camp. Communities across Ireland are now facing drilling, fracking and mining licensing on a scale never before seen in Ireland. In spring 2011 the Irish government awarded licensing options to three shale gas exploration companies which span almost million acres, in eleven different counties. A vibrant grassroots campaign responding to the threat of fracking is now emerging consisting of numerous local groups and networks throughout Ireland. For everyone who wants to stop the ‘extreme energy’ takeover of Ireland - Rossport is the place where the fight is now on. The tools and tactics which are being to take action against Shell and to hamper the Corrib gas project are exactly the tactics that extreme energy industry are most worried about - a recent gas-industry report identified blockades of drilling operations, for example, as highly effective. Shell’s Corrib Gas Project is only the start of the planned giveaway with 2012 being one of the busiest years for offshore drilling in Ireland in several decades. Exxon Mobil will begin drilling off the Kerry coast in 2013, while another consortium plan to drill the Spanish Point prospect off Clare. Oil companies are also currently looking into ways to process oil finds off Dalkey in Dublin and Barryroe off Cork. Oil company-estimates of the oil and gas under Irish territory that has been licensed by the Irish Government is 1.6 trillion euro. Under the current oil and gas terms, Ireland will get virtually nothing out of the exploitation of that oil and gas. In a review of oil and gas terms in 159 countries, the US Government Accountability Office in 2007 found Ireland to have the second worst deal in terms of government take, after only Cameroon. Former head of the Corrib Gas Project, Brian O Cathain has stated that “Corrib will pay no tax”. The current terms also leave the country with no control over the use of its own oil and gas. Rossport is where we must draw a line - and say that Irish resources must be under the democratic control of the people of Ireland. Talk by local community members the campaign and current situation. Legal Workshop - practical information about laws, dealing with the Gardai, Courts. Actions to disrupt Corrib Gas Project, including disrupting Shell truck movements which are necessary for tunneling. Solidarity events with the local community. Discussion on maintaining solidarity in the future. See https://www.rossportsolidaritycamp.org for further information.